While some of us view rabbits as a cuddly and furry pet, then there are those of us that view them as a food source. In fact, rabbits have been raised for food for thousands of years. I tried it for the first about 25 years ago and I’ve been hooked on it since then. Frying it is my favorite way to cook it, especially after letting it marinate overnight in buttermilk and herbs. Enjoy! Whisk together buttermilk, mustard, salt, pepper, thyme, oregano, and cayenne in a bowl, and pour into a re-sealable plastic bag. Add the rabbit pieces, coat with the marinade, squeeze out excess air, and seal the bag. Marinate in the refrigerator for 4 hours or overnight. Combine the flour, baking powder, garlic powder, onion powder, and a bit more pepper in another plastic bag. Shake to mix thoroughly. Transfer marinated rabbit one piece at a time into the dry ingredient bag, and shake well to completely coat each piece. After all rabbit pieces are coated, repeat the process by dipping them in the buttermilk marinade and shaking in the dry coating again. Heat oil in a large frying pan over medium-high heat, making sure not to burn the oil. When oil is hot, fry the rabbit in batches until golden brown and juices run clear, about 8-12 minutes. 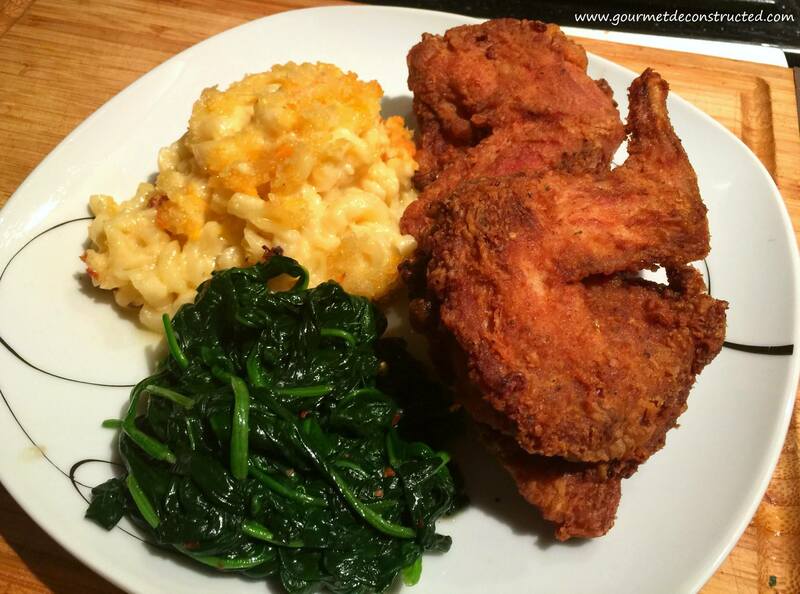 Serve with the side dish of your choice, I had mac & cheese and spinach with mine. Bon Appetit! Posted on January 31, 2017, in Wild Game and tagged brine, buttermilk fried rabbit, buttermilk marinade, comfort food, deep fry, oregano, Rabbit, soul food, thyme, wild game, wild game meats. Bookmark the permalink. 2 Comments. That’s a lovely thought Justice. I must try it. rabbit is easy to get though not too popular hereabouts. I hope all goes well in the Big Apple.